Acrylic yarns are some of the most popular yarns for making amigurumi – they are machine washable, cheap, and durable. Previously, I talked about my top acrylic yarn, Vanna’s Choice, but when I can’t find the right colour, I need to stray from this line and use something completely different. Another acrylic yarn I like using is Canadiana by Patons. It is a lighter worsted weight yarn than other popular acrylics, like Red Heart Super Saver and Vanna’s Choice, so creates smaller amigurumi. You may need to go down in hook size if you are used to the heavier worsted weight acrylics. What do I like about Canadiana yarn? (1) Comes in a variety of bold colours – The main reason I will turn to Canadiana is because of the awesome colour selection. Not only is there a lot of choice, but the colours themselves are very bold and bright – great for amigurumi! There are solid colours, as well as variegated options. I was able to find the perfect Christmas colours for my Felix the Elf pattern. (2) Easy to find and at a good price – Like Vanna’s Choice, you can find this yarn in a variety of stores, as well as on many websites online. This means you can use store coupons and sales to get it at a great price! (3) Nice to crochet with – This yarn is soft and smooth, so is great to work with. It runs through your fingers nicely and has a bit of stretch for easy stitching. (4) Creates a soft, stretchy fabric – Because of its softness and stretch, Canadiana makes really squishy and cuddly amigurumi. The stretch is also great when making my dog collar pattern, because the collar can slip over a dog’s head! (5) Machine washable and dryable – I have never machine washed my amis before, so I can’t say how this yarn actually holds up, but Patons claims it “washes and dries beautifully”, which is great if you are making your amigurumi for children. What don’t I like about Canadiana? (1) Shiny – If you like yarn with some sheen, then this trait would actually be a plus for you, but I am not a huge fan. While it isn’t as shiny as other acrylics out there, it has more sheen than Vanna’s Choice and the non-premium cheap acrylics. Because the shininess also makes the yarn somewhat slippery, knots may not hold as well with this yarn. (2) Fuzzes easily – Likely a factor of this yarns smoothness, it also fuzzes up quite easily, so isn’t as durable. For some reason, I found the black to be especially bad for this…don’t know why! (3) It’s acrylic – While acrylic yarn has its benefits, it also has features that aren’t so great. The production of acrylic yarn is not environmentally friendly, and it doesn’t have the same feel as real wool. Have you used Patons Canadiana yarn before? What do you think of it? This is the fourth post in a series I am doing on how to hand-dye yarn using food colouring. Previously, (1) I harnessed the heat of the sun to dye a small skein of yarn bright yellow, (2) slow cooked my yarn in a crock-pot until it was a gorgeous pink, and (3) turned a bit of yarn teal right on the stove top. This time I am going to show you how I used the microwave to dye my yarn green. 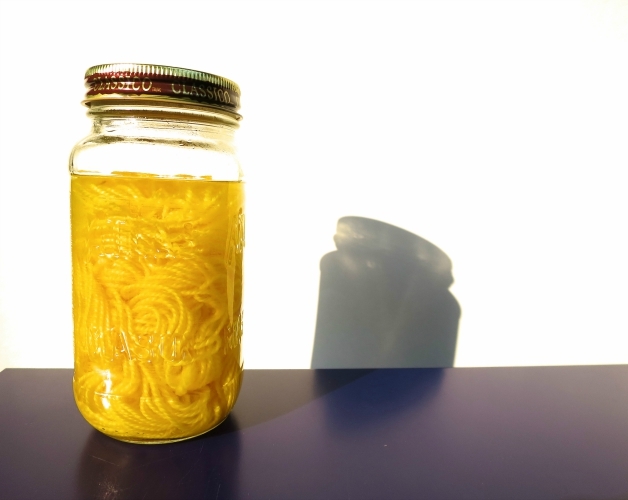 If you missed the first post on hand-dyeing, make sure you read at least the first section on the basics of dyeing with food colouring and how to prepare your yarn. This method is the fastest and is super easy, but you have to watch out and make sure you don’t burn your yarn. It is possible to overheat your yarn and burn it when using a microwave if your yarn isn’t wet enough, especially if you aren’t familiar with the strength of your machine. If your yarn has enough moisture, however, this shouldn’t be a problem! This time I chose the Kelly Green dye from my box of 12 Wilton Icing Colours to dye the little 25 g skein of alpaca wool yarn I had made during my first dying experience. I pre-soaked my yarn for about 30 min in a bath made up of vinegar (2 tbsp) and water (2 cups). I used these volumes because my dye is green (so needs more vinegar than yellows and reds, see DyeYourYarn.com), and the total volume was able to cover my yarn fully. In a one pint glass mason jar (just needs to be microwave safe), I mixed 1 cup of water with 1 tbsp of vinegar and some Kelly Green Wilton icing dye. I just estimated the amount of dye, but used no more than 1/4 tsp because I didn’t want extra, and therefore wasted, dye that wouldn’t be taken up by the yarn. I based this on the info found on theDyeYourYarn.com site for Wilton dyes: “[Use] 1/16 teaspoon Wilton®Icing Gel on .2 oz Lion Brand® Fishermen’s Wool. This amount of gel produces a saturated dyebath. Using more gel will leave food color in the dyebath that will not bond.” I then whisked the solution until most of the gel clumps were gone and dissolved. Next, I transferred the wet yarn from the pre-soak bath into the jar. Before you transfer your yarn, make sure that your two baths are not drastically different in temperature. This reduces the chances of your yarn felting. I then placed the jar with the yarn in the microwave, cooked it on high for 1 minute, then checked it to see if all the dye had been absorbed. I repeated this process (microwave for 1 min, check dye bath) until no more dye remained in the surrounding water (which means all the dye has been taken up by the yarn). At each check, I mixed the yarn around a bit so that my yarn would have even colour. After just three minutes of heating the water started to boil, so I let it sit for some time before heating the yarn further. After the dye had all been absorbed, I left the yarn in the jar and allowed it to cool to room temperature. Once cooled, I removed the yarn and rinsed it to remove any excess dye. You don’t want to suddenly rinse your hot yarn with cool, or even warm water, because this may cause your yarn to felt, so make sure your yarn is completely cooled before this step. Once rinsed, I gently squeezed the excess water out and hung the yarn to dry. How does using the microwave compare to my other dyeing experiences? I think I may have used too much dye in this case. I needed to heat the yarn so much the dye bath started to boil before all the dye had been absorbed. Once I let the yarn sit and cool down, a lot of the dye was absorbed, but still not all of it, so I needed to do yet another bout of heating. In the end though, I was satisfied with the great colour saturation and how easy and fast it was to use the microwave over the other methods. So, I have tried all four methods of heat setting dye: solar heat, slow cooker, stove top and microwave – and which is my favourite? I think I will mostly be using the microwave in the future. It was so easy and fast! I would consider using the heat of the sun again, however, on hot summer days – it doesn’t use up as much electricity! 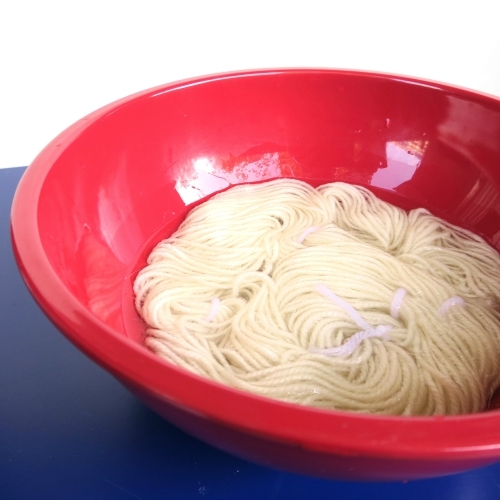 This is the third post in a series I am doing on how to hand-dye yarn using food colouring. Previously, I harnessed the heat of the sun to dye a small skein of yarn bright yellow and slow cooked my yarn in a crock-pot until it was a gorgeous pink. This time I am going to show you how I used the stove top to dye my yarn teal. Unlike the sun and slow-cooker methods, the stove top method needs more of your attention during the process. You need to continuously monitor your yarn and dye solution to make sure it doesn’t get too hot while on the stove – you don’t want it to boil! Once you have dyed your yarn this way several times and know the temperature level on your stove that will give you a hot solution that doesn’t boil, the method is pretty simple. This time I chose the teal dye from my box of 12 Wilton Icing Colours to dye the little 25 g skein of alpaca wool yarn I had made during my first dying experience. I pre-soaked my yarn for about 30 min in a bath made up of vinegar (2 tbsp) and water (2 cups). I used these volumes because my dye is blue (so needs more vinegar than yellows and reds, see DyeYourYarn.com), and the total volume was able to cover my yarn fully. In a small pot, I mixed 2 cups of water with 2 tbsp of vinegar and some Teal Wilton icing dye. I just estimated the amount of dye, but used no more than 1/4 tsp because I didn’t want extra, and therefore wasted, dye that wouldn’t be taken up by the yarn. I based this on the info found on the DyeYourYarn.com site for Wilton dyes: “[Use] 1/16 teaspoon Wilton®Icing Gel on .2 oz Lion Brand® Fishermen’s Wool. This amount of gel produces a saturated dyebath. Using more gel will leave food color in the dyebath that will not bond.” I then whisked the solution until most of the gel clumps were gone and dissolved. Next, I transferred the wet yarn from the pre-soak bath into the pot. Before you transfer your yarn, make sure that your two baths are not drastically different in temperature. This reduces the chances of your yarn felting. I then topped up the dye solution using some of the water from the soak bath until the yarn was fully covered. Finally, I turned the stove element on to about medium-low and allowed the solution to heat up, but not boil. Make sure the water doesn’t boil, otherwise your yarn may felt! I then kept checking the dye solution every 5-10 min or so to make sure it wasn’t boiling and to see how much dye was still in the water solution (a clear water bath indicates that all the dye has been taken up by the yarn). I had my solution heating for quite some time (over an hour) and the dye bath was still not clear , so I started to wonder if I had used too much dye. I decided to just turn off the stove element anyway, placed a lid on the pot, and let the yarn sit in the dye bath as it cooled. Once cooled, the solution was almost clear! I am unsure whether I needed to heat the yarn for so long before letting it sit (and tutorials online have mixed directions) – more experimentation is needed! Done! I LOVE how my yarn turned out this time. The teal colour is gorgeous! How does it compare to my other dyeing experiences? Because I was unsure of how long to “cook” the yarn before letting it cool, this method took longer than I anticipated. I had expected it to be faster than the slow-cooker, but more labour intensive (ie. you had to monitor it more), but it took almost as long as the slow cooker! I think that was an error on my part, however. I think it would have been fine heating the yarn for a shorter amount of time (either 30 min or until it almost boiled) before turning the element off and letting it cool in the dye. And the yarn? I think this method dyed the yarn just as wonderfully as the previous two methods. Because I was monitoring it more, I did stir the yarn around a bit in the pot (unlike for the slow cooker), so the colour came out more uniform and solid than my pink skein did. If I had wanted a more mottled look, however, I could have easily just let it sit in the pot and not touched it so that some edges remained slightly out of the dye bath. Stay tuned for a future post on the next, and last, method: Microwave dyeing!